NMR Case Studies: Data Analysis of Complicated Molecules provides a detailed discussion of the full logical flow associated with assigning the NMR spectra of complex molecules, also helping readers further develop their NMR spectral assignment skills. The robust case studies present the logic of each assignment, from beginning to end, fully exploring the available range of potential solutions. Readers will gain a better appreciation of various approaches and develop an intuitive sense for when this particular concept should be implemented, thus enhancing their skillsets and providing a host of methodologies potentially amenable to yielding correct assignments. Authored by a scientist with more than 20 years of experience in research and instruction, this book is the ideal reference for anyone in search of application-based content. The book addresses complicated molecules, including corticosteroids, biomolecules, polypeptides, and secondary metabolites. Jeffrey H Simpson, PhD, was Director of the Instrumentation Facility in the Department of Chemistry at M.I.T. from 2006 to 2017. 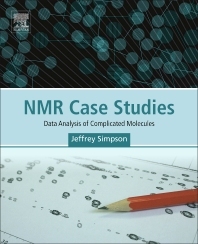 Dr. Simpson’s career in NMR/instrumentation research and instruction spans 20 years, and he has authored an introductory text on the subject of NMR as well as publishing a number of peer-reviewed articles. He is one of the Founding Members of the New England NMR Society and served as VP from its inception to 2017. He currently is a faculty member in the Department of Chemistry at the University of Richmond.